Posted on Sat, Feb 25, 2012 : 6:22 a.m.
Smoked Salmon Stars: a wood grilled pizza crust smeared with dill cream and topped with smoked salmon and a garnish of caviar. Having an Oscar party? Trying to decide what should be on the menu? Here's a simple but spectacular appetizer. People often pay homage to Oscar nominated movies with thematic food inspired by the hits. But I prefer to pay homage to Wolfgang Puck, who for years has been the official caterer for the Governor's Ball post-Oscar bash. Despite being born and raised in Austria, Puck generally is regarded as one of the forefathers of California cuisine. I remember going to his restaurant, Spago, years ago when it was the hottest table in Beverly Hills. I'd be lying if I didn't fess up to going in part to check out the star-studded scene, but mostly I went for the famed smoked salmon pizza. And it didn't disappoint; that pizza is still one of my favorite food memories. The simple goodness of a wood grilled pizza crust smeared with dill cream and topped with smoked salmon and a garnish of caviar was luxurious and accessible all in one delicious bite. I've made many of my own riffs on Puck's California culinary style since that first bite. One of my favorites is to take the idea of the classic smoked salmon canape and make it playful. 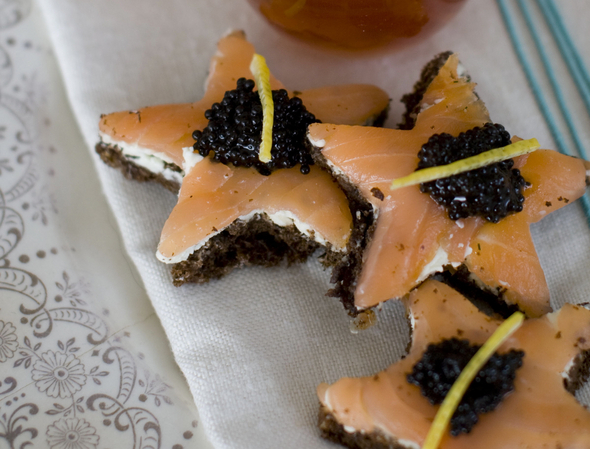 All it takes is a little imagination and a sturdy cookie cutter to make these smoked salmon stars. This is an Oscar-worthy treat that is appropriate regardless of your favorite movie or actor. Everyone will love to eat them, they are easy to make — more an assemblage than an actual recipe — making them a good choice for the novice host. And don't put the recipe away once the Oscars are done; the idea is adaptable to every occasion. I frequently make them in the shape of pigs, using a pig cookie cutter, of course! Have one of your guests bring a bottle of Domaine Carneros rose sparkling wine to serve with these festive appetizers. They work so well together. To make the zest, use a sharp citrus stripper to peel long strips from a lemon. Make sure you get only the yellow peel, as the white pith underneath is bitter. If you do this in advance, cover the zest with a damp paper towel and plastic wrap so the lemon curls do not dry out before you use them. 6 slices of pumpernickel bread or "Texas Toast"
Toast the bread, then let it cool to room temperature by placing on a rack or leaving in the toaster. If you put the hot toast on a plate, it will steam underneath and become soggy. Spread about 2 to 3 teaspoons of Boursin cheese over each piece of toast. Top with salmon, trimming to fit, if necessary. Use a star cookie cutter to cut each slice into as many stars as possible. Garnish with lemon peel strips. Place caviar in the center of the star. Nutrition information per serving (values are rounded to the nearest whole number): 80 calories; 40 calories from fat (47 percent of total calories); 5 g fat (3 g saturated; 0 g trans fats); 15 mg cholesterol; 7 g carbohydrate; 4 g protein; 1 g fiber; 240 mg sodium. Sat, Feb 25, 2012 : 6:59 p.m. Check the photo caption against the photo and the recipe, guys.